After 14 hours and 50 minutes on the floor, Senate Democrats finally concluded their historic filibuster—the 8th longest since 1900, when precise record-keeping officially began. 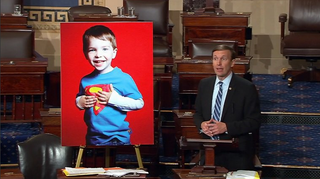 Connecticut Senator Chris Murphy launched the filibuster at 11:21 a.m. on Wednesday in attempt to push stricter gun control legislation following the massacre of 49 people at Pulse nightclub in Orlando over the weekend. Votes would be held on whether to ban people on the government’s terrorist watch list from obtaining gun licenses and whether to expand background checks to gun shows and internet sales, he added. “We did not have that commitment when we started today,” Murphy said. Murphy is seeking a vote on legislation from Feinstein that would let the government bar sales of guns and explosives to people it suspects of being terrorists. Feinstein offered the amendment in December, a day after an extremist couple killed 14 people in San Bernardino, California, but the Republican-run Senate rejected the proposal on a near party-line vote. Murphy also wants a vote to expand background checks. According to C-SPAN2, 40 senators joined Murphy over the course of the day.